Saturday night we said good-bye to our sweet boy Rocket. He was a good friend and a loyal companion, a special fellow, charming everyone who crossed his path. We were lucky to have him. We are especially sad, as this loss falls on the heels of losing Binnie, our little rabbit, the week before. We're a sad bunch around here right now. So sorry to hear about Rocket. It's always so hard to lose a pet. Aww, I'm so sorry that you lost your beloved pets. Sending Hugs & Prayers for you and your family. That is always the toughest day. You're in my thoughts. Oh dear, I'm so so sorry. Sending big hugs. We lost our beloved Golden this year, and it was a great loss to our family. We especially miss him now at Christmas. I am so sorry for the loss of your beloved Rocket and little Binnie. It is so hard to say goodbye to our sweet companions. So sorry to hear about the loss of both of your sweet pets. I know they were more than just pets, they were a part of your family. Oh, I am so sad for you all. Our pets are so much a part of our families. I hope Christmas will bring some cheer for you and your family!! Oh, Pam, I'm so sorry to hear of the loss of Rocket and Binnie. Focus on all the wonderful memories; they will forever live in your heart. Oh no! I'm so very sorry to read about Rocket - he's such a sweet looking little guy. You and your family are in my thoughts and prayers. You know I'm a crier. I'm so sorry about Rocket and Binney. You know he is heaven chasing my Camille and Samantha. Or is Samantha chasing Rocket? She was Siamese and that's how she rolled. I'm so sorry! I'm really feeling for you right now - as we have gone through many a loss of a pet over the years and ...it never gets easier. Each and every one is precious. Aww. I'm so sorry. Sending you a virtual hug. Years ago we had two Siberian Huskies -- Kody and Bandit. They were litter mates. We lost bandit to a tumor and then Kody's health immediately deteriorated and we lost her to a kidney ailment about a month or two later. Losing a precious animal companion is tough in the first place but even harder when it happens one after the other. Oh, dear. I am so terribly sorry Pam. They start out as pets and weazel their way into our hearts and become our family, our friend and our confidants all in one. Sending love and hugs!!!! Lo siento,se les coge mucho cariño pero como todos un dia se van ,un abrazo. Oh sweet friend, I am so sorry for your loss of both pets. They bring such joy to our lives and its so hard to let them go. Thinking of you. I'm so sorry Pam. What a cutie he was. Losing two pets so close together is especially tough. My thoughts are with you and your family. Sorry for your loss. The loss of a pet/member of your family is so hard. Thoughts and prayers are with you. So very sorry, 2 sweet buddies in a few days is especially heartbreaking, oh how we love them. Lost our boy a few months ago and even now I think I hear him plodding down the hall as only a bullie can. Hugs to you all! I'm so sorry Pam. Take care. So sad to learn of the loss of your dear pets. It's always sad to lose anyone, especially at Christmas. What a sweet, sweet, boy. I'm sorry for your loss. I am sorry for your loss of your pets. They always become a big piece of our hearts. Merry Christmas, Pam. I'm so sorry to hear about your sweet little Rocket and Binnie. Our pets are such a huge part of our families and so much more than pets. They will live on forever in our hearts. 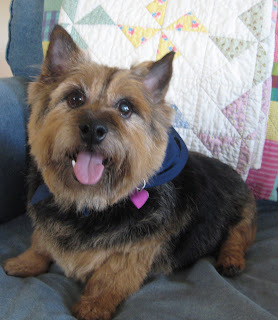 So sorry to hear about Rocket, we lost our Dog Dallas on Saturday also, he was our "big Sweetie" for 14 1/2 years. He was a great dog as I am sure Rocket was too. thoughts and prayers sent your way. I was glad to meet you on the 14th. But I was shocked to hear this news immediately after. I'm so sorry for your loss. I have a old dog too, so I can imagine how hard it can be. Take care. Oh Pam, so sorry to hear about little Rocket. So sorry to hear about your lovely little Rocket. I know how sad it is to lose a loved pet.. I'm so out of it I didn't realize. It would be like us saying goodbye to Shadow. I'm sick for you. You'll miss Rocket and Binnie both so much. I'm just now getting caught up on blog reading… I'm so sorry to hear about your losses this month. Our pets are such a part of our families - I know your heart is aching - I am so sorry. What a sweet picture of your little guy. Oh Pam, I'm so sorry to hear about Rocket. I know how hard it is, but know you gave him such a happy life. Awwww, PKM, I'm so sorry to hear about Rocket and Binnie. I hope your happy memories of both of them will take away the pain a little. XOXO. Have a Pam Kitty Morning with me!